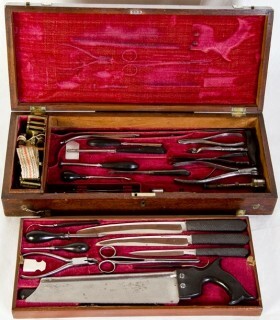 The 19th century was a time of great change for surgeons and doctors in England. At the beginning of the century they were able to do very little for their patients and their main role was to provide comfort and reassurance. However, by the end of the century doctors had a greater understanding of disease, how to prevent it, and how to help patients through it. It was not until the beginning of the 20th century that doctors and surgeons became highly respected citizens. • The British Medical Association was formed in 1832. How would this have impacted on the journey of passengers onboard these vessels? • How did the skills of surgeons in 1836 differ to those surgeons have today? • How have medical practices changed over time and what causes these to occur? • Who provided medical care onboard? 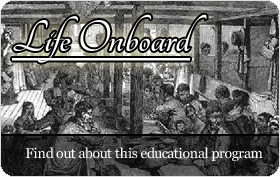 • What were some of the common diseases and ailments onboard emigrant ships in 1836? • What methods were used to treat these ailments? • What caused people to be healthy or unhealthy in the 19th century? • The surgeons onboard these ships in 1836 had little medical experience. Nowadays if someone has completed an advanced degree, which is usually three to four years of further study after a bachelor's degree at university, they can have the term doctor (Dr.) associated with their name. There are many types of doctors, including MD, PhD and PsyD. What do these acronyms stand for? Research other types of doctors and compare the differences between areas of expertise. Historical questions and research: • The most common cause of death onboard migrant ships was dysentery. Once it occurred, it often became uncontrollable and was quickly passed onto others. Research dysentery the causes, effects and treatment. Use a fishbone diagram to show the different causes of dysentery. • Before the mid 1800s surgery was performed without anesthesia and some procedures would have been extremely painful. What were some of the strategies surgeons and doctors used to try and numb the pain experienced by patients of this time. 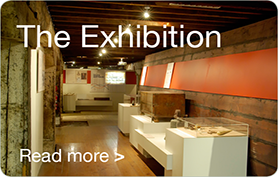 • Who invented anesthetics and how has this revolutionised the medical profession? Analysis and use of sources: • Passengers who experienced illness onboard had little or no access to medical services. How does this differ from the services we have access to today? Use a map of your local community to locate the health services you are able to access. Interview school and community members to identify the demographics of people who access these services. Collate whole class data and draw conclusions from the information gathered. Perspectives and interpretations: • Surgeons in 1836 were always men. Why do you think this was this so? • It was not until 1876 that an act was passed in England to allow women to train as doctors. Who was Dr Elizabeth Garrett-Anderson and what was her role in enabling women to train as doctors? • If the surgeon knew or guessed the cause of an epidemic, it was beyond his powers to order a change in diet or get additional drugs to combat the outbreak. How would you feel knowing that you have been sharing a cabin with someone who is extremely ill? How would this affect the rest of your journey? • Develop a tri-fold brochure that would have been useful for the passengers onboard these vessels, outlining tips on maintaining good health and procedures to follow if sickness occurred. What are the major developments in medicine that have occurred since 1836? Select the 10 most significant developments and show these on a time line. Be prepared to give reasons for your choices. A majority of the deaths onboard were infants and children. Discuss the possible reasons for this. Investigate the needs of different groups within your community, including the aged, infants, toddlers, children and people with disabilities. What services are available for these sectors of the community? Research significant people in the medical profession between the years 1800 - 2000. Select an individual and write a one page biography that summarizes their life and achievements. Collate information to develop a whole class book. Medical specialists in 1836 had little knowledge about the way disease and viruses were passed on to others. We now know that some viruses travel through air and others thorough bodily fluids. Identify some of the major illnesses in the 19th century and develop a‘t chart’ to show those that are passed through air and those that are passed through bodily fluids. Develop a slogan or community service campaign educating others about the spread of disease and ways to prevent it. How can hygienic measures be implemented at school? What does the future hold for us? Do you think there will one day be a vaccine or cure for some of today’s life threatening illnesses such as cancer? Who undertakes research to develop new vaccines and cures? Learn about organisations that raise money and undertake cancer research. Take action and get your class involved in fundraising for one of these organisations. A person displayed the symptoms of measles onboard. What practices would have been put in place to prevent the spread of the disease? All passengers should have a medical check and kept in quarantine at least 2 weeks prior to departure. Next week one of the ships will cross the Equator. Learn about a special event onboard, an event that still happens today. What is this event and what are the origins behind it?